An ASIC is an “Application Specific Integrated Circuit”. Rather than designing an IC for general-purpose use, such as an amplifier or voltage regulator, ASICs are usually designed specifically for one client to provide a function required by the client’s product. For example, a cell phone company may design an ASIC to combine the display backlight controller with the battery charging circuit into a single IC in order to make the phone smaller. By integrating an ASIC into products, companies can drastically reduce their bill of materials and improve the performance of their products. However, these aren’t the only benefits ASIC technology can provide. Here are 7 ways that companies can greatly benefit from ASIC integration. An ASIC device can replace a whole collection of standard off-the-shelf components in your electronic device, reducing the number of items on your bill of materials (BOM) and eliminating their costs. For medium or large volume production, this cost savings can be quite dramatic. For small to medium volume production the cost savings can be on par with previous BOM’s if not lower. Because a single ASIC device can replace a whole collection of standard components in your electronic assembly, the total number of interconnects is reduced, and reliability is improved. Also, an ASIC is a proprietary device, and provides a strong barrier to competitive reverse-engineering. An ASIC can drastically reduce the physical size and weight of the overall electronics assembly, which reduces component cost. As stated above, an ASIC device provides a substantial benefit in reduced BOM costs for large volume manufacturing. Through our findings, we estimate a 40-60% reduction in development costs using our ASIC approach. It is difficult to estimate a definite percentage since projects tend to be measured on a case-by-case scenario. When developing a custom ASIC, the PCB surface area is often shrunk into a much smaller footprint. As circuitry becomes smaller, signals inside the ASIC tend to communicate more easily, which reduces the overall noise inside the custom IC. As with any integrated circuit, noise is inevitable, but there are a few practices that can help. An ASIC can improve the overall performance of an electronic assembly in several very different ways: signal integrity; size, weight, and power (SWaP); intellectual property protection; and reliability. An ASIC is physically much smaller than its equivalent circuitry made using off the shelf parts, and any electromagnetic interference picked up by the ASIC circuitry has much less total energy. The smaller size of ASIC circuitry means smaller signal line loading, so signals can more easily communicate at high speed within an ASIC than they can on a conventional PCB assembly. Smaller signal loading also means less vulnerability to ground loop or ground bounce interference. 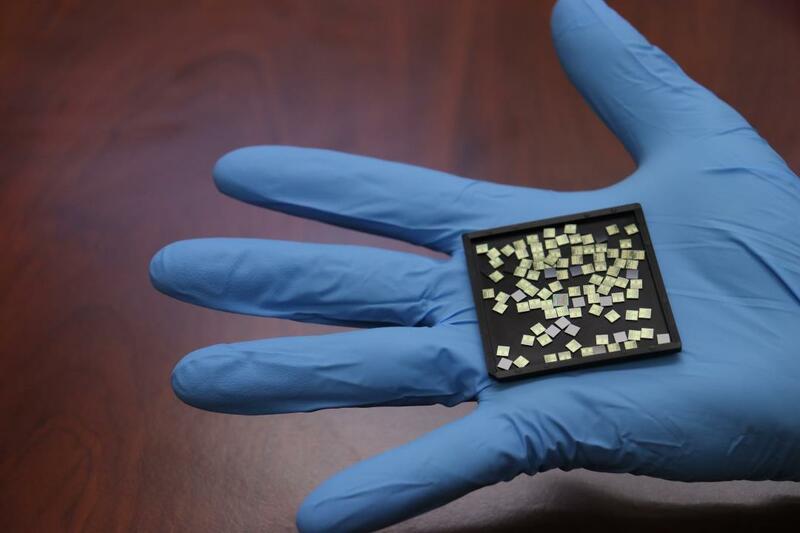 A single ASIC device can replace a sizable list of off the shelf components, drastically reducing the size and weight of an electronic assembly. Smaller signal line loads within an ASIC mean less power is spent to transfer the signals within the ASIC, so less total electrical power is needed to perform the function. Smaller SWaP = better overall performance. An ASIC is immensely more difficult to reverse engineer compared to a PCB assembly built of off-the-shelf parts. Very IP-sensitive applications can gain additional protection from configuration data stored in EEPROM, invisible to standard de-processing. Integrated circuits can be “de-processed” or “de-layered” to discover the detailed physical structure; this is a standard technique for detailed failure analysis or destructive physical inspection. The de-processing of an ASIC device is far slower and more expensive than inspection and reverse-engineering of a PCB assembly. Parts of a design can be included in non-hardware form, such as flash or EEPROM memory data, to make an electronic device design even more resistant to reverse engineering (this can be true of non-ASIC designs also, but one needs special attention to using secure memory storage so a reverse-engineering attempt needs to include more than just reading out the memory contents). “Cloning” of an integrated circuit typically refers to duplication of the external form and function of an integrated circuit. This might be an authorized and intentional duplication, such as when a customer needs an additional or alternative source of supply. Or, this may be an unauthorized duplication, such as when a competitor wants to copy the device and obtain an unauthorized source of supply, or when an unscrupulous supplier wants to sell counterfeit material. An ASIC makes it very difficult and expensive for competitors to clone your device. A single ASIC device can replace a long list of off-the-shelf components, and greatly reduce the number of electrical connection terminals in an electronic assembly. Each connection terminal is a potential failure point, so conversion to an ASIC gives fewer solder joints to inspect, and a significant reliability improvement. The typical measure of ASIC reliability is mean time to failure (MTTF). Different kinds of failure mechanisms typically have different rates of activity, and different sensitivities to temperature (or “activation energies”). The usual failure mechanisms for circuitry within an ASIC device are much slower than failure mechanisms that occur at solder joints or other significantly disparate material interfaces. Aside from a performance improvement, a product using an ASIC requires fewer electronic components and is cheaper to assemble. Using ASICs in a design also reduces the number of component vendors involved in producing the product, thereby simplifying production planning and purchasing. With a proprietary ASIC device as an item in your BOM, you have better control over a critical part of your supply chain. Companies can also integrate a single ASIC across multiple product families. Integrating ASICs among product families allows companies to develop unique and highly-reliable products without having to rely heavily on electronic component vendors.